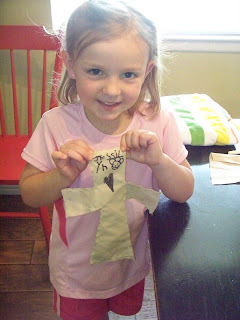 I was making some curtains for our room last week, and Jessilyn kept begging me to sew. 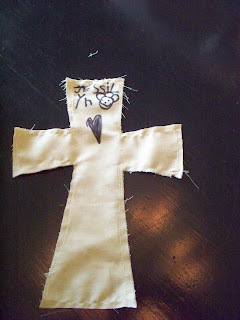 I asked her what she wanted to make, and since it was Easter week, she decided she wanted to sew a cross. I helped her line up the needle, explained how to keep it straight, and showed her how to turn corners with the stitches. I kept helping her until she told me, "Mom, you just have to show me one time, then I can do it by myself!" So I backed off and let her go all on her own. She did great! She only went off the material one time, and her stitches were pretty straight. I wish I had used a contrasting thread color so you could see it better (you can click on the pic to zoom in), but here is the finished product. Alright, Jessilyn! If you can do it, I can do it. Wow, Jessilyn, you did a GREAT job! I love your cross! Aww, I love it! She did awesome! Ahh! that is so cool! Hope you guys are doing well!!! Oh!! She did such a good job! How cute!!! I want to see those curtains also! !